Home » Building Muscle » FAQ – What is STS? FAQ – What is STS? You've likely heard this acronym mentioned on MFP or Facebook by one of us, or posted as a workout by someone else in the fam. STS is a strength training program by Cathe Friedrich that we LOVE. It stands for Shock Training System. It is a 90 day program, and one of the only ones that we personally recommend for all fitness levels. I (Kiki) usually don't really get into 90 day DVD programs (not saying that they aren't good, but there are usually some flaws, that I can address another time), but this particular program passed my inspection with flying colors. Why? Because Cathe Friedrich is hands down, the best in the business. She's been in the game for decades, and is constantly improving. Her workouts are sold mainly through “word-of-mouth” advertising. Not only is she that good at what she does, but she's not just about being a celebrity. She is a true athlete, and if you allow her too, she can train you to be the same. The STS program does not lie in you merely picking up any random weight and doing a set amount of reps. The program incorporates the 1 Rep Max (1RM) factor which takes this series to the next level. The 1RM testing makes it so that no matter what your fitness level, you will be lifting the proper poundage for the amount of reps in each Mesocycle. Which brings me to the next concept. The Mesocycle concept: This series moves in three separate phases, and each workout in each phase has you lifting at different percentages of your 1RM, it's a very scientific approach to helping you gain the strength and body composition that you seek. 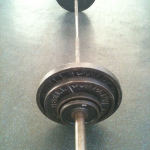 If you are very new to strength training, this is an invaluable tool to have in your disposal. If you are a vet, but hate doing the math all the time — or just want to relax and have your workouts planned out for you for a while — this will also work for you because her workout manager (FREE, whether you own the program or not) makes it SO easy to figure out your 1RM percentage, that you will kick yourself for not using it sooner. Check out the video clips below from each of the three Mesocycles. The program is available as a DVD or download. So if you have a fully equipped home gym, you can do the workout at home. If you prefer to hit the iron at the gym, you can download the workouts to your iPod/iPhone/Android, etc., and just get in the zone at the gym. Pull-ups are a large part of the back program and are included in every back workout in Meso 1 and 2, but disappear in Meso 3. * There are many exercise variations that I can suggest for you in place of the pullups. That being said, I will still suggest that you try to attempt them as often as possible, because they create such a dramatic result for your body. Whenever they are called for, I still think you should try to do as many as you can, before moving to a substitution to finish up the remaining reps. There are ways to improve in how many you can do, and I can give suggestions if you need them. *Side note: Same goes for push-ups in M1, they are frequent, and they are KILLER! And just when you start to hate Cathe and want to trash her and the whole dang program – M1 ends, and you are off the hook for push-ups M2 and 3. How do I test my 1RM? 4) Insert both numbers (weight lifted and actual times lifted) into the Workout Manager – it does the rest! Workout Manager will pre-enter your weight for that exercise –for each Meso — based on the amount of reps in that workout and the percent of your 1RM that you're supposed to be working at. All you have to do is print your pre-filled cards for each workout. Easy peasy. Can I skip 1RM testing? But, having said that <<<(notice how I always throw in the disclaimer? )…If you don't want to do ALL of them, on the 1rm chart, the exercises are starred in correlation with their 1RM importance – so you could just do the four or five star ones if you wanted to cut back on how many you have to do. That's what we did for my hubby (yep, he uses the program too). Just be aware that you will be doing a lot more updating that way, than if it were all done beforehand. But, at least you'll able to get started on it. Plus, whenever you decide to do the program again, you'll already have your other numbers as a starting point. For myself, I did finish all of the 5 stars before starting, but there were still many times when I had to update because I was able to go heavier or lighter on a certain exercise. I just blocked out the space of about a week, and did the 1RMs as my workout for that week. It didn't necessarily take a week to do, because I may have had rest/cardio days in between. But I just planned it that way, so it could be done at my leisure, and I could become more familiar with the program. I just kept an eye on the clock, and popped in each disc going once through each move and jotting down my weight used. When it got to be the time of an average workout had gone by (45 min -1hour), I stopped and stretched. By the end of the week I had my 1RMs done, and even some DOMS to boot! FYI, I tried to keep all of the 1RM testing exercises related. For example: I did all of the chest exercises on the same day (going through multiple discs 1,4,7,10, etc – doing ONLY exercises that had not been tested yet). Then legs the next day. Then all of the back exercises on another day, if that makes any sense. This is what helped it to be more of a workout than just “wasting time” doing 1RMs. By the time you get to the third or fourth disc that day, you will only have a few new exercises to test for, so it goes by faster with each disc. Don't take my word for it! Find out more, and read reviews on STS and other Cathe products for yourself here before deciding if it's right for you. This is excellent. Thank you for sharing! I’m very excited to begin training with the DVD bundle, especially since I just got a squat rack for the home gym. Yes, that helps tons! Thanks! I started with the basic, and purchased the Squat Rack Leg routine, separately, about a year later.